The AIM-9 Sidewinder is a supersonic, heat-seeking, air-to-air missile. It has a high-explosive warhead and a passive infrared guidance system. It is used by a variety of Western fixed-wing combat aircraft and helicopters, and has been adopted for surface-to-air use as the Chaparral missile. Unit cost ranges from USD $56,000 to USD $70,600. In 1949, a small team at NOTS (later NWC) China Lake, led by Dr. McLean, investigated the passive Infra Red homing problem, with limited financial means. Surprisingly, the result of this low-profile research project is still known as one of the world's leading dogfight missiles. As if the financial limitations were not restrictive enough, the team imposed on itself one further restriction: it chose for an airframe of only 5 inch (127mm) diameter, which made fitting in the necessary electronics (still vacuum-tube in those days) a major challenge. The research led to a contract, awarded to Philco in 1951, for a homing head. On 11 September 1953, the first successful missile, designated XAAM-N-7, was fired and the missile reached IOC in 1956. Designations were N-7 (US Navy), GAR-8 (USAF) and SW-1 (Development). The AIM-9 designation was assigned to the Sidewinder in 1962, while RB.74 is the Swedish designation. Over the years, the missile has been continuously improved and updated, the latest projected versions being the AIM-9R and AIM-9X. Early Sidewinders consisted of sections of cilindrical aluminum tube, with the seeker head fitted at the front end together with the control fins. The rear end has four fixed fins, each containing a so-called 'rolleron'. These patented rollerons are in fact small wheels, one of which is mounted at the rear tip of each fixed tailfin. These wheels are slightly milled at the edges, so they are made to spin at high-speed by the slipstream. The rollerons act as air-driven mini-gyros, their inertial moment resisting every change in attitude. This way, they tend to roll-stabilize the missile. Both tailfins and control surfaces are in a cross-like arrangement. The missile's main components are an infrared homing guidance section, an active optical target detector, a high-explosive warhead, and a rocket motor. The infrared guidance head enables the missile to home on target aircraft engine exhaust. An infrared unit costs less than other types of guidance systems, and can be used in day/night and electronic countermeasures conditions. The infrared seeker also permits the pilot to launch the missile, then leave the area or take evasive action while the missile guides itself to the target. The early models used an uncooled PbS (Leadsulfide) seeker which yielded a 70% SSKP (Single-Shot Kill Probability) in ideal conditions, but extremely bad results in less-than-ideal circumstances. The seeker showed a tendency to lock-on to the sun or reflections from water surfaces. De original solid-engine was produced by Hunter-Douglas, Hercules and Norris-Thermador, and accelerated the missile to Mach 2.5 in 2.2 seconds. The original version was built in 3 almost identical versions, with the majority of missiles produced being of the 9B variant. 80,900 were built by Philco (later Ford) and Raytheon, and a further 15,000 were built by a European consortium. 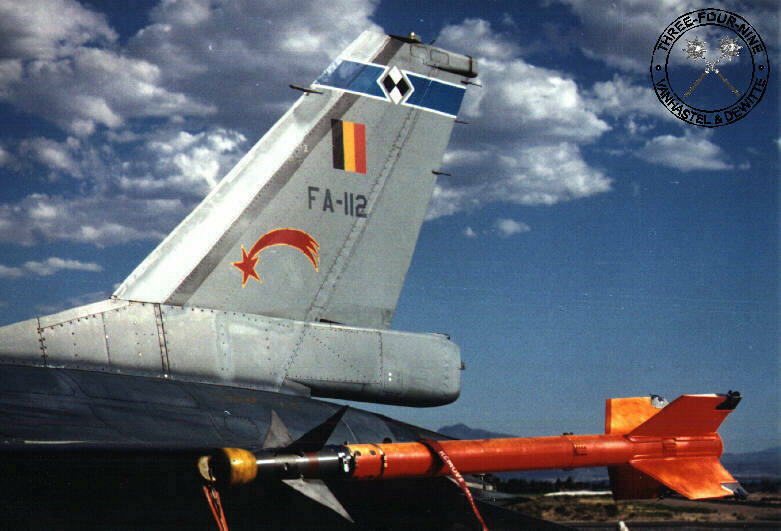 The AIM-9B FGW.2 is a modification made to the European missiles in the late 60s, incorporating a new seeker head designed by BGT with silicium nose dome (silicium is - at infra red wavelengths- more transparent than glass), a cooled seeker and solid-state electronics. The C and D models are both realizations of the same model (the SW-1C) built by Motorola and Ford respectively, introducing the Rocketdyne Mk.36 solid motor providing for greater range, and a new guidance system. The 9C was actually a SARH variant for the F-8 Crusader but proved to be unreliable, while the 9D offered an improved nitrogen-cooled IR seeker with a magnesium-fluoride dome. The 9D also offered a smaller field-of-view, faster tracking/reticle speed, detachable larger fins powered by high-power actuators fed from a longer-burning gas generator, and a 22.4lbs continuous-rod annular blast-fragmentation warhead replaced the old 10lbs one. Both IR or HF fuzes could be fitted. The Echo expanded the engagement envelope at low altitudes through its new Ford seeker head with Peltier (thermoelectric) cooling and new electronics - enabling faster tracking speed. The AIM-9E has an improved guidance and control system, as well as a more aerodynamic nose. This model provides greater range and enhanced low-altitude capability against maneuvering targets. 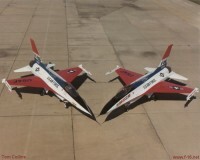 Some E models are equipped with reduced-smoke rocket motors and have the designation AIM-9E-2. The AIM-9G was the first firsion to include SEAM (Sidewinder Expanded Acquisition Mode), basically an improved AIM-9D seeker head, but was quickly made obsolete by the AIM-9H. The latter was the first model to offer limited all-weather capability, as well as solid-state electronics and double-delta control surfaces resulting in a superior maneuverability compared to older models. SEAM slaves the seeker head of the missile to the radar when in "dogfight" mode, which enables the seeker head to be uncaged, slewed toward a specific target by the aircraft radar, and made to track that particular target before being launched. The AIM-9Js are rebuilt 9E or 9B missiles, sacrificing range for speed. Detachable double-delta controls were added, as well as solid-state electronics and a long burning gas generator. The J model has an expanded target-engagement cone which enables it to be launched at any spot in the rear half of a target aircraft rather than merely at its exhaust. The Dash-1 and Dash-3 are improved versions and actually all-new. the AIM-9J-1 later became the AIM-9N. The AIM-9L introduced yet another new guidance system making it a true all-aspect missile (which means it doesn't need to be aimed at the exhaust of the target but can also lock on e.g. wing edges heated by air friction), and an annular blast-fragmentation warhead surrounded by a sheath of pre-fragmented rods. It uses a proximity-fuze, consisting of a ring of GaAs (Gallium-Arsenide) laserdiodes and corresponding photodiodes. If the target is close enough to reflect the emitted light back to the receiving photodiodes, the warhead is fired. This improved optical fuze increases the missileös lethality and resistance to electronic countermeasures. Despite its basic design, the all-aspect AIM-9L Sidewinder still remains a potent threat, exceeded in effectiveness perhaps only by the Russian-built Molniya/Vympel R-73 (known in the West as the AA-11 Archer) which combines aerodynamic and thrust-vectoring control systems. The AIM-9M has the all-aspect capability of the L model, but provides all-around higher performance. The M model has improved defense against infrared countermeasures, enhanced background discrimination capability, and a reduced-smoke rocket motor. These modifications increase ability to locate and lock-on a target and decrease the missileös chances for detection. Deliveries of the M model began in 1983. The AIM-9M-7 was a specific modification to the AIM-9M in response to threats expected in the Operation Desert Shield and Desert Storm theater of operation. The AIM-9P is either a B/E or J rebuilt or all-new and offers new motor, fuze and better reliability. It has greater engagement boundaries, enabling it to be launched farther from the target. The more maneuverable P model also incorporated improved solid-state electronics that increased reliability and maintainability. Deliveries began in 1978. The AIM-9P-1 has an active optical target detector instead of the infrared influence fuze; the AIM-9P-2 added a reduced-smoke motor. The most recently developed version, the AIM-9P-3, combined both the active optical target detector and the reduced-smoke motor. It also has added mechanical strengthening to the warhead as well as the guidance and control section. The improved warhead uses new explosive material that is less sensitive to high temperature and has a longer shelf life. The AIM-9P-4 adds all-aspect capability to conversions. AIM-9M with upgraded guidance/control section. The AIM-9R was originally funded as the AIM-9M Product Improvement Program (PIP). Under Pave Prism, the research effort continued for enhanced clutter rejection, better aim-point selection, increased field-of-view for tracking highly maneuverable or off-boresight targets and better IRCCM (Infra Red Counter Counter Measures). The seeker head incorporates a 3-gimbal stabilized optical platform bearing a new Imaging IR (IRR) seeker with a focal plane array, which can lock on at greater ranges than any previous version, a digital image processor and autotrack function, and the use of EPROM (Electronically Programmable ROM) to facilitate software upgrades. The 9R also dispenses with the refrigeration system, which was mounted either in the missile itself (USAF) or inside the launcher shoe (US Navy versions). The USD $50 million development effort began in 1987, and the first 65 pre-production IIR seekers were delivered to the US Navy in May 1990. Five out of the six first tests were successful. In September 1991, the US Air Force dropped out of the AIM-9R program, arguing that the $103,000 unit cost was too high (Unit cost estimates range from $70,000 according to the Navy, to as high as $180,000.) The Air Force withdrawal put the full financial burden on Navy budgets, leading to a decision in December to drop the AIM-9R altogether. AIM-9M with IRCCM deleted for Foreign Military Sales customers. Navy/Air Force program for successor to Sidewinder. Acquisition plan approval planned by mid-1992 after completion of requirements documentation. 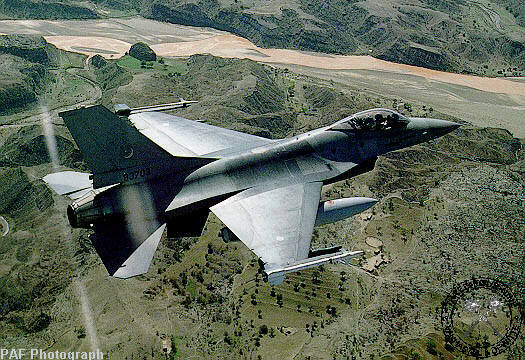 This formerly classified USAF program began in 1988 in conjunction with Raytheon to overhaul Sidewinder design. The missile introduces tail control with small independently activated tail fins shaped like those on the MIM-104 Patriot, and eliminates wings and rollerons, relying on the body for lift. The missile has greater acceleration, a 50-g maneuvering capability, and fits into 1/4 of the weapons bay space required for conventional AIM-9. The guidance system offers Electronically Erasable Programmable Read- Only Memory (EEPROM), and a digital roll-control autopilot. The "Box size" (i.e., the square dimensions of its container) is 7.9 in (200 mm) compared to the 20 in (508 mm) of the standard Sidewinder. Obviously, the Box Office is designed to be fitted in the internal weapons bay of aircraft such as the F-22, so more can be carried in a given volume. Similar to Box Office, but undertaken by the US Naval Air Test Center at China Lake, CA. The wings are merely reduced in size instead of being eliminated. 3070 559 78.0 60 17.7 ? 2850 630 87.0 60 19.3 ? 3100 279 83.9 ? ? ? 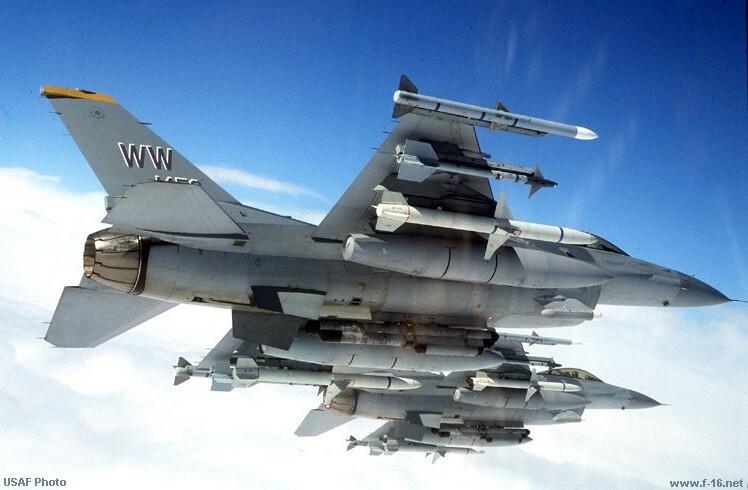 On the F-16, AIM-9 Sidewinders can be loaded on stations 1 and 9 (wingtip), 2 & 8, and 3 and 7 (1 missiles on each station). The simplicity of the AIM-9 with 'less than 24 moving parts' (as advertised) made the missile in a low-cost and reliable piece of armament which was above all compatible with most exisitng aircraft types. Although earlier version were restricted to perfect visibility, close stern engagements, later versions quickly alleviated these problems. In order to fire a missile, the pilot listens in his headset for the signals of the missile. As soon as the missile is uncaged, the pilots hears a 'seeking tone'. As soon as the missile has acquired a target, the tone changes into a 'growl', varying in pitch according to the quality of the lock. Later variants of the missile can be slaved to the radar, so when the pilot achieves a radar-lock on a target, the radar can 'tell' the Sidewinder where to look for it. The first operational use of the Sidewander came in October 1958, only 2 years after the system achieved IOC. Large Numbers of rounds were fired by Nationalist Chinese F-86s against Chinese MiG-17, with 14 kills claimed in one single day. Extensive use of the Sidewinder was made in the Vietnam conflict, however we were unable to find any statistics. If anybody could help us out on this one, we'd appreciate it!. During the 1982 air engagements over Lebanon's Bekaa Valley, 51 out of the 55 Syrian-flown MiGs shot down were hit by Sidewinders. During the Falklands war in 1982, 100 AIM-9L missiles were supplied to the RAF and RNavy, since none of the European-produced Lima models had actually reached British forces. Used by RN Sea Hariers and RAF Harriers (deployed on board RN ships), the missiles scored 25 known kills against Argentinian aircraft.